Playing video games professionally is such a strenuous and time-consuming job that pro gamers regularly run into the problem of burnout. The latest person to succumb to this unfortunate trend is Gonzalo “Zero” Barrios, the reigning champion of the Smash Bros.’ eSports scene. Ever since the Wii U version of Smash came out and tournaments started to pop up around it, Zero has maintained a strong lead (if you can call it that) against any and all competition that comes his way. He dominated in every major Smash tournament, so much so that one tournament organizer put a bounty on his head. Even when the Smash tourney rules were switched up to start allowing custom moves, he couldn’t be defeated. Like anyone maintaining themselves at such a high level of competitive play against countless aspiring challengers, Zero’s place at the top of the Smash Bros. food chain hasn’t come easy. The job was demanding enough that Barrios just took fans by surprise with the announcement that he’s no longer going to be attending the upcoming Smash tournament Paragon, which begins tomorrow in Las Angeles. After thinking long and hard about it, I’m not going to Paragon 2015 anymore. Ever since EVO I’ve felt a tremendous burn out in the game. I constantly push myself hard, and hard, and it’s taking a toll on me. I just can’t take it anymore. It’s really hard for me to sit down and practice like I used to because I’m just burned out from long hours of practice every day for most of this year. Most of my time is spent in working on my YouTube channel, and other aspects of my life, the rest of the time is practice. But since I haven’t been able to do that, I simply don’t feel mentally prepared to compete at such a tournament right now. I haven’t been sleeping properly, practicing properly, and I just don’t feel well in general. I’m too stressed, burned out and tired from everything. I need a break, and that’d help me get back on my Smash ways. I’m taking a 3 week break, where I’ll clear my mind, enjoy my life and do things that make me happy and relax. Just have a good time. I’ll be back for Big House 5 where I plan to be back stronger than ever. I talked to my manager and TO of paragon about this, and they’re both understanding. I apologize to all the fans who wanted to see me play at Paragon, but my health comes first and I hope you guys can understand that. Thank you. As Zero says at the end of the statement, his break from tournament Smash play is just that: a break. He’s not planning to just stop playing Smash altogether. He’s not even stepping away from tournament play for that long—he’s already planning to attend another competitive event after Paragon. I still find Zero’s statements a tad disconcerting simply because Smash is only just beginning to emerge as a bonafide eSport, and as it continues to grow, top players like him are only going to have more and more pressure placed on them. 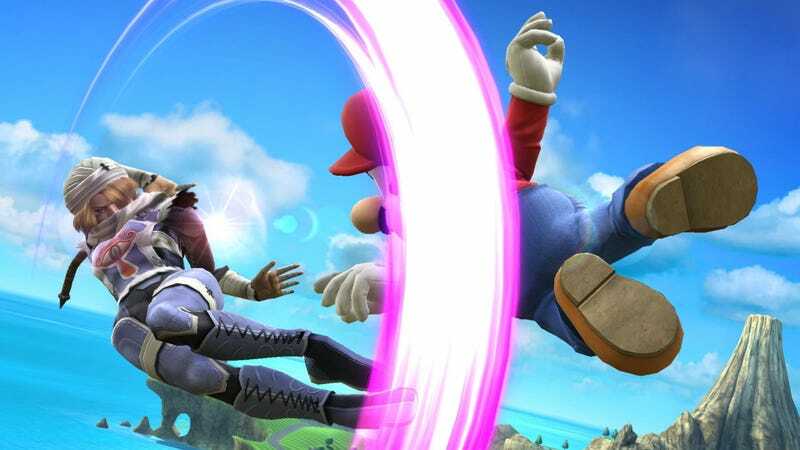 That’s combined with the existing tensions of playing Smash 4 (the Wii U version of the game) as opposed to Super Smash Bros. Melee, which is still considered the gold standard of the fighting game series by many fans, and is therefore still played regularly at tournaments as well. Barrios is also one of the few Smash pros who’s actually signed to a team—the eSports organization TSM brought him on earlier this year. TSM also owns a League of Legends team, for a point of comparison, and tales of League pros being worked into the ground over the span of their remarkably short careers are old as the game itself. I’d much rather see Zero be able to play professionally for longer, rather than have him push himself so hard now that he has to cut his career short. Hopefully TSM will provide him with the proper support so he can actually do that.